It was promised when the title was announced earlier this year and Creative Assembly has delivered. The free "Mortal Empires" DLC was put up on Steam last week and owners of both Total War: WARHAMMER 2 and Total War: WARHAMMER can now play as 12 of the possible 13 factions (Norscans will be added later) across a large map that combines the "Old World" map from the first game with the "Eye of the Vortex" of the second. There's a catch to all of this, naturally. While the "Mortal Empires" DLC is free to download and install, and it also supports two player online co-op, you have to own both games in order to play it. That caveat applies to both players, too. 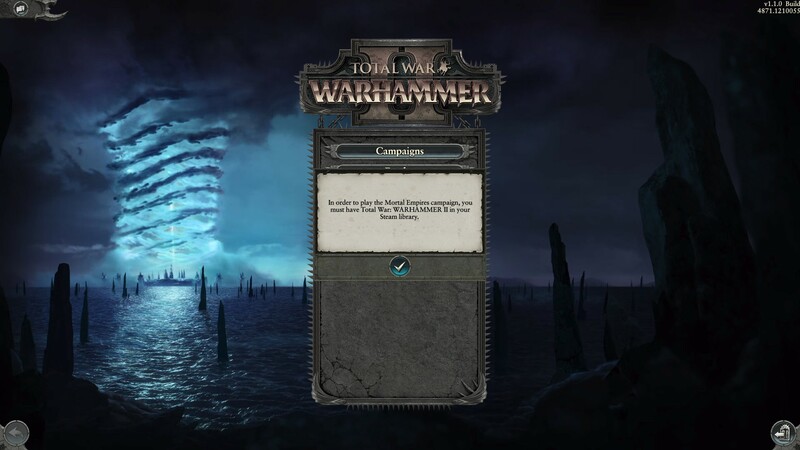 So, if you've got a friend that only picked up Total War: WARHAMMER 2 after you raved about it and the first one, then they cannot join you in a Mortal Empires campaign even if you host it because they only own one of the games. So, yes, the DLC is "free" if you've forked over $120 to buy both games. As a general service announcement, the messages you receive if you don't own both games and try to play the "Mortal Empires" campaign are confusing. The first message you'll see states you need to have Total War: WARHAMMER 2 in your Steam Library. I'm guessing the error means to say Total War: WARHAMMER. If you click past that error and attempt to join a friend's game who owns both, you'll see a new message that informs you additional downloadable content is needed. 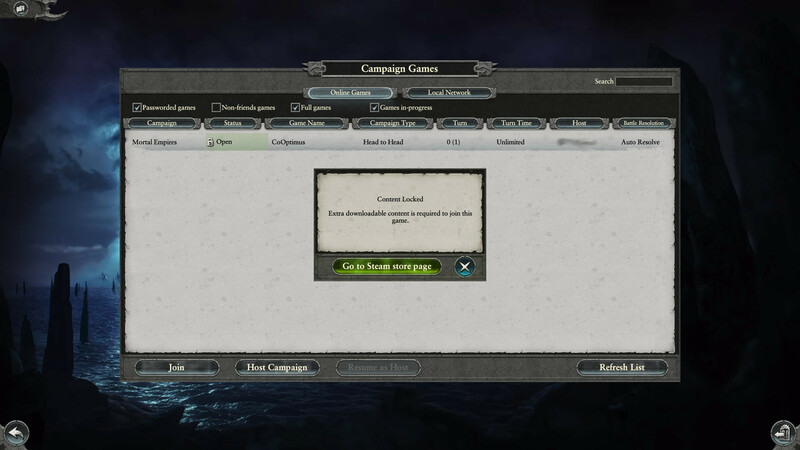 Clicking on the option in that message to go to the "Steam store page" takes you to the "Mortal Empires" DLC, which you likely already have installed. None of this is to say that both games aren't fun/great, but it would have been nice if Sega or Creative Assembly allowed folks to join a friend's "Mortal Empires" campaign and then do something like limit which factions/races are available to the person that only owned the sequel. 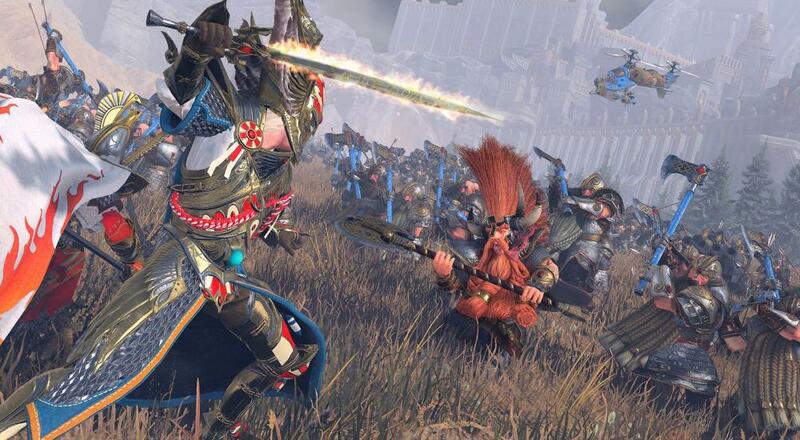 Friends could play together, and watching your buddy stomp around as Beastmen or Dwarves serves as a pretty good incentive to picking up Total War: WARHAMMER. The good news on the co-op front is that "Mortal Empires" is a little more open than WARHAMMER 2's "Eye of the Vortex" campaign. As there's no set objective/goal (just conquer everything to win), you and your buddy are free to play as different races (or the same) and work together. There's an FAQ over on the Creative Assembly website that goes over a few other things, like starting positions for some lords and overall install size for this DLC and the game. Total War: WARHAMMER 2 is available now on PC via Steam. It supports two player online/LAN co-op in the (main) "Eye of Vortex" campaign, and two player online/LAN co-op in the "Mortal Empires" DLC campaign. Four player online/LAN co-op is supported in the "Battles," which allows players to choose their race and units for an army, and then battle against A.I. opponents. Page created in 0.8613 seconds.